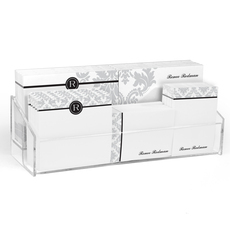 Set of 50 flat printed note cards with your choice of rounded corners or medallion shaped cards. Cards are fully designed on both sides. Front design is grey damask on white and back design is ebony damask on white. 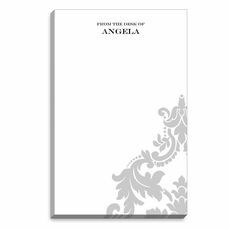 Personalized with your choice of name, monogram or initials in hot pink ink. Cards measure 6.25” x 4.5”. 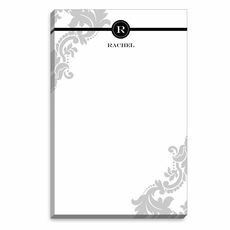 Includes blank, unlined envelopes. Optional envelope lining and/or printed return address. Packaged in a gift box.